Everybody who lives in Los Angeles, CA knows how powerful the sun can be. While the sunshine is pleasant, over-exposure may discolor anything inside your building and make it difficult to work over the glare. The best treatment is exterior window film from Solar Art. This product blocks the harmful sun without blocking your view of Los Angeles. Offices of all shapes and sizes look more modern with exterior window tinting. Tinting shields your building from harmful rays and gives it a modern appearance. Your tenants will enjoy the freedom from screen glare as well as the privacy they'll get from tinted windows. In addition, you'll see a big shift in your heating and cooling costs when you block additional solar radiation warming up your building. When you save this much energy, you may be eligible for a utility rebate from the Los Angeles utility authorities. 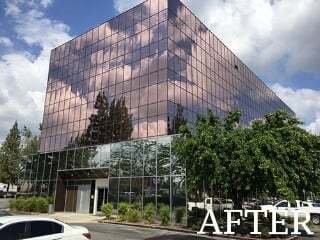 Exterior Window Film from Solar Art in Los Angeles is similar to our indoor window tint and other film products. No matter what color or kind of building wrap you want, each of them benefits the appearance and function of your building. We use your existing glass to begin the application process, so you don't have to worry about the expense of entirely new windows. Our film matches precisely to your window's shape and size, so the end product looks natural. Solar Art has the expertise to complete the work quickly, no matter how many windows your building has. Our exterior window film is available in many colors, many of which can be mixed together or applied as a solid hue. Solar and tinted applications can benefit your property in several ways. In many situations, our customers see cheaper heating and cooling costs, happier employees without screen glare and more privacy for all occupants inside. 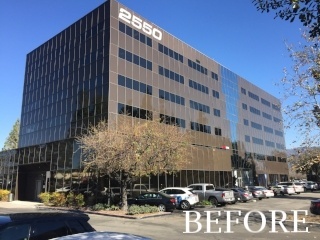 From huge sky scrapers to small office buildings, Solar Art is prepared to serve companies across the Los Angeles, CA area with top-notch refinishing for indoor and outdoor windows. Our helpful customer service reps are standing by to provide you with more information and a free quote today.